Sri Lanka's government has marked the birthday of Tamil Tiger leader Velupillai Prabhakaran with a vow to kill him. 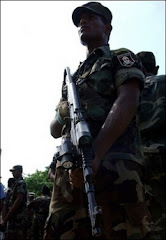 The island's powerful defence secretary, Gotabhaya Rajapakse, said Colombo now had the upper hand in the long-running conflict, with the elusive guerrilla chief limited in both his movements and ability to score strategic victories. Earlier this month the political head of the Liberation Tigers of Tamil Eelam (LTTE), S.P. Thamilselvan, was killed in what the government said was a precision air strike on the north and not a mere lucky hit. Monday was also the day the LTTE chief marked his 53rd birthday, and Rajapakse said that if all goes to plan it will be his last. "We are after him. We are specifically targeting their leadership," he said. He also signalled that the year ahead would see a renewed escalation of the conflict, finally closing a chapter of "phoney war' that began with a 2002 Norwegian-brokered ceasefire and its progressive collapse. "Our objective is to weaken them. We have to defeat them militarily, we have to control Wanni," he said of the LTTE's northern stronghold. "It is possible. We just have to squeeze them. Then a political solution becomes possible," the defence secretary said, repeating his view that the Tamil Tigers only used a truce to smuggle in more arms and can therefore only be bombed into peace. Prabhakaran, in his speech Tuesday, is also expected to cast aside any talk of diplomacy and issue a rallying call to his thousands of hardened guerrillas. The LTTE supremo, renowned for his ability to bring out the suicidal tendencies in his followers, has also managed to withstand successive government offensives in the past. And over the past year, he has unleashed new weapons -- namely light aircraft sent on nocturnal missions to strike as far south as the capital and damage Sri Lanka's economy in the process. "Black Tiger" suicide squads have also been active. Still, Rajapakse brushed aside the significance of such rebel attacks. "In the end it's just symbolic. it affects morale, but strategically it makes no difference," said the defence secretary, who narrowly survived a suicide bomber sent by Prabhakaran last year. "In the end, what have they gained during the last 20 to 30 years? Just destroyed property and destroyed lives."